Dainty silver plated hoops with pewter accents and freshwater pearls. Copper filled sterling ear wires. $14 a pair. More colors coming soon! All have sold. Some new bracelets made with assorted gemstones, silver plate and pewter. Blue goldstone, jasper, iolite, ocean jasper, sodalite, rock crystal, labradorite and moonstone. Agate, malachite, jasper, labradorite, serpentine, ocean jasper, moss agate, jade, and adventurine. This is such a beautiful stone. Green Opal, also know as Australian or Petrified Green Opal, is a birthstone for October. It is said that this stone aids in visualization, imagination, dreams and healing. Just a few of the gorgeous things you will find in my booth this weekend at the Seattle Waterfront! Two more weekends left in September and then I will be taking a break from my booth. At shows customers often ask me how long I have been beading. My usual reply is, "oh since I was a teenager". I got to thinking just how long ago that is! I still have the first thing I ever made, a seed bead daisy chain. A really fun thing I also saved is the cardboard box, order form and instructions that came with that first bead order. Gloria's Glass Garden in Beverly Hills, CA. I have no idea how I found it. Check out the prices, 35 cents for a box of seed beads!!! I beaded for a few years and then got busy with other crafts and endeavors. Fifteen years later I came across the box and daisy chain, and started anew. I took a basic earring class at Bead It, a tiny bead store tucked into a corner of Mall of America, the closest mall to my house. I gave my creations as gifts for many years and made things for myself. I had earrings enough to wear a different pair everyday! My first "show" came about in 2001. I was between jobs and someone suggested I try selling jewelry to make some extra money. I spent three weeks making things, invited everyone I knew and had a December holiday show at my home. Looking back at some of those designs makes me appreciate how supportive my friends were! The next month I took a small business course and Beadware was born. I paired up with my friend Maria and her new soap business, Earth Essentials. A graphic designer friend, Rita, came up with a theme for us, Beads and Bubbles. She created graphics for postcards and invitations. I continued to do shows in my home, 2 or 3 a year, for several years. Then came my move to Washington. I set up my studio, started doing home shows here and returned to Minnesota for shows once a year. 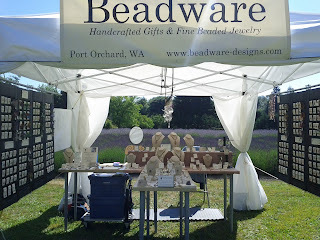 In 2010 I took Beadware full time and dove in to the public show circuit. I started with the Fremont Sunday market, or as I affectionately refer to it, Vendor Boot Camp. I learned so much! I also set up an online store on the popular Etsy. Beadware has grown steadily since then. For Beadware's 10th anniversary I gave my brand a new look, going from bright colors to something more professional and polished. 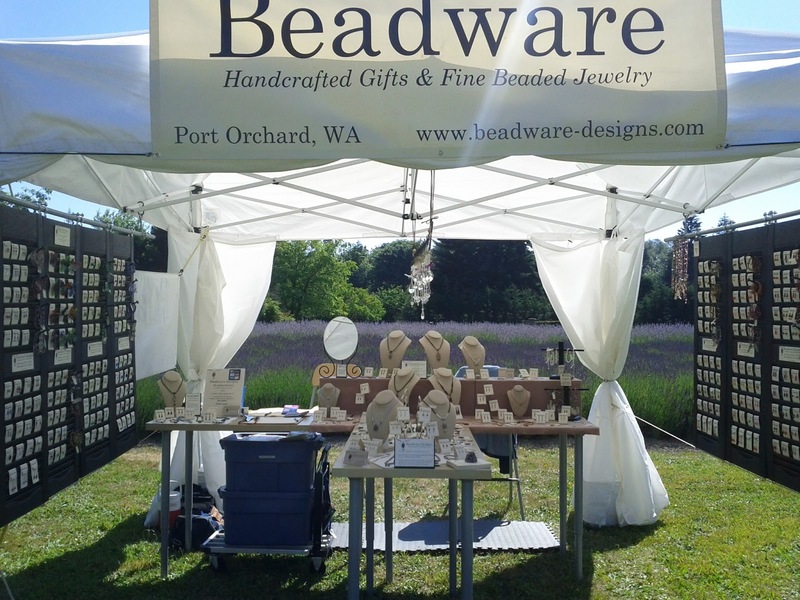 I do shows around the Puget Sound region. This year I began working with a wholesale rep and now have several accounts. Goals for the coming year include developing my own website with shopping capabilities, expanding my wholesale work and investigating out of state shows. Taking your artwork public is daunting. It takes a while to develop a thick skin and not take rejection of your work personally. I appreciate all of the great feedback and support I have gotten from my family, friends and customers. I've also enjoyed developing a new circle of artsy friends. New experiences, friends, skills, success, failures, frustrations and inspirations all become a part of my lifelong "daisy chain".